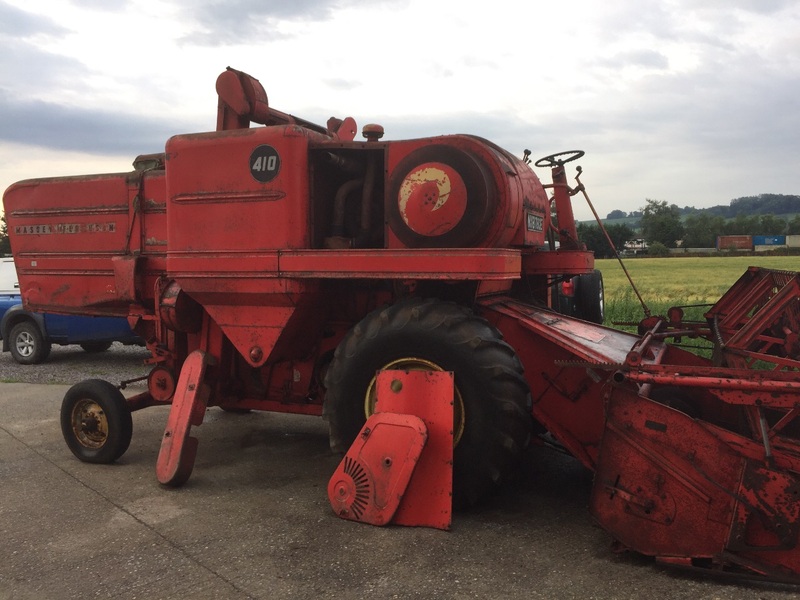 During the last few months of 2015 I received an e-mail from a gentleman enquiring whether I would be interested in taking on another 400 combine. As we already run two machines I was hesitant in my reply as the hardest thing I have to do is turn away additional machines that more often than not end up cut up even very tidy ones, obviously storage is a major obstacle for me and time is another big factor in trying to keep this stuff in working order at harvest time! But we persevere and do our best. The gentleman commented that as the combine was local to me I should take a look!? Well this last remark had me somewhat dumbfounded! As I pride myself on knowing what's around me here in Somerset and when I found out this machine was less than 4 miles from my home I was shell shocked?. 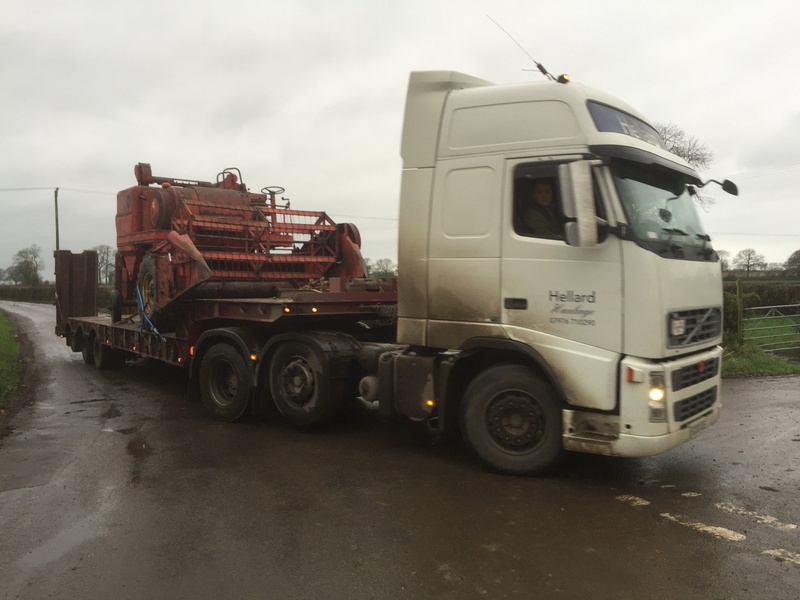 I arranged to visit the gentleman's home the following week, on arrival at his premises I was directed up to a shed where as I entered I was confronted by the sight of an 8ft 6 Table (header) fitted to a 410!! As I quickly cast an eye over this grand old lady the full story of the machine was explained in detail. 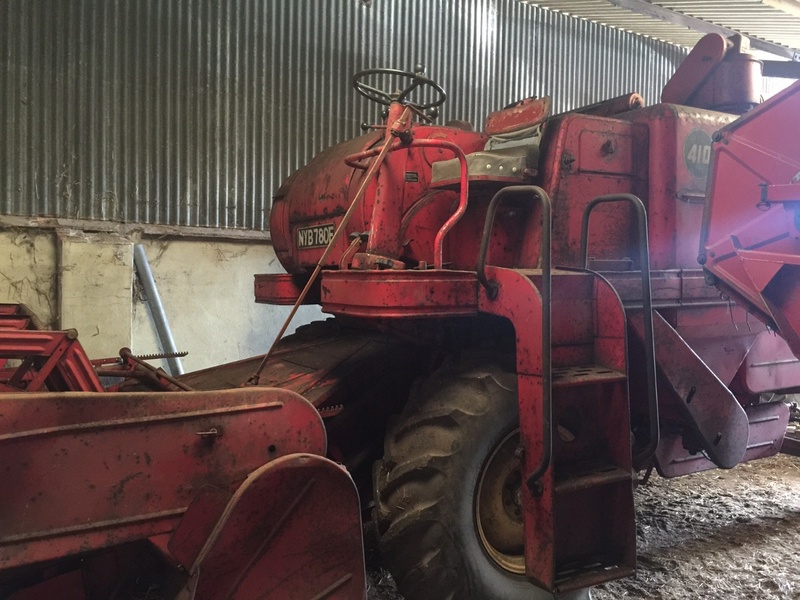 The Combine had had 2 owners practically neighbours and the second owner kept the combine and used it up until the early eighties, and then it was parked up and somewhat forgotten about. This explains the reason that no one local could remember the machine or had seen it!. 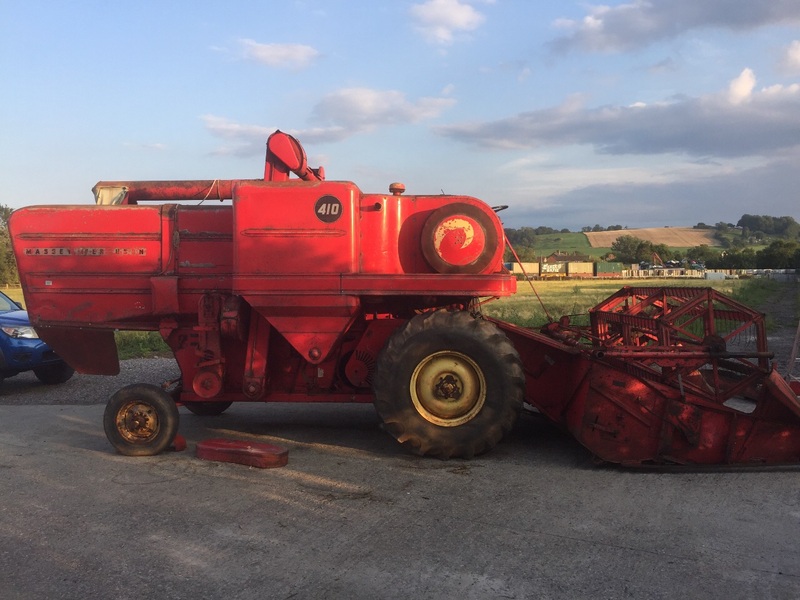 The Second owner had sadly passed away and the combine had been passed onto Darren Wilcox and His father who were friendly with the deceased owner. Itwould take some tlc to remove the Combine from its 20 plus year hibernation and this required a new fuel pipe a change of filters and a new battery, unfortunately the gear linkage had ceased and manual selection of the gears was aided with the help of a metal tube pushed over the selector arm on gearbox. Finding an 8ft 6 cut 410 to be honest today is something of a stroke of good luck they weren't that common and they would be specifically ordered by customers ,i knew of several models that worked in around Devon and Cornwall and possibly around parts of Wales, but common they were not and I feel very privileged now to own one especially with a Somerset registration. Darren and his father are the owners of best selling local cider Wilcox cider farm, at Shipham near the famous Cheddar Gorge, Darren explained to me that he wanted the combine to stay in Somerset and if possible be used as intended, and he was very happy for me to take the combine on just a few short miles from its original home and add it to our small collection here of vintage machinery. An inspection of the combine confirmed it had seen little work, the auger flights are square the elevator housing slats and chains all in New order even the seat base cushion, has no rips or wear! The bodywork was coated with a film of oil after harvests resulting in the black appearance especially on the top surfaces which is quite thick and like treacle!! 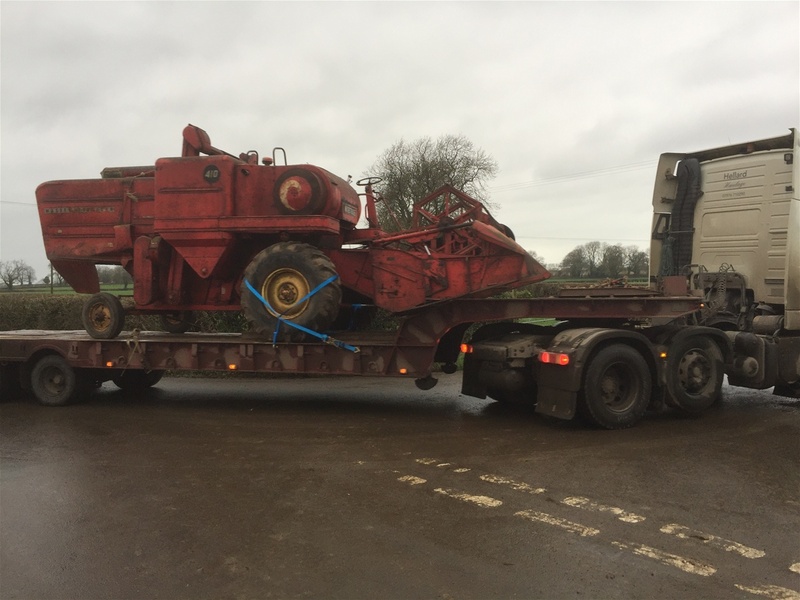 As this is an 8ft 6 cut it has no outer wheel weights on rear for counterbalance as its not needed, but it has inner 168lbs weights, unlike the 400 combine with 10ft cut which carries 280Lbs outer weights. 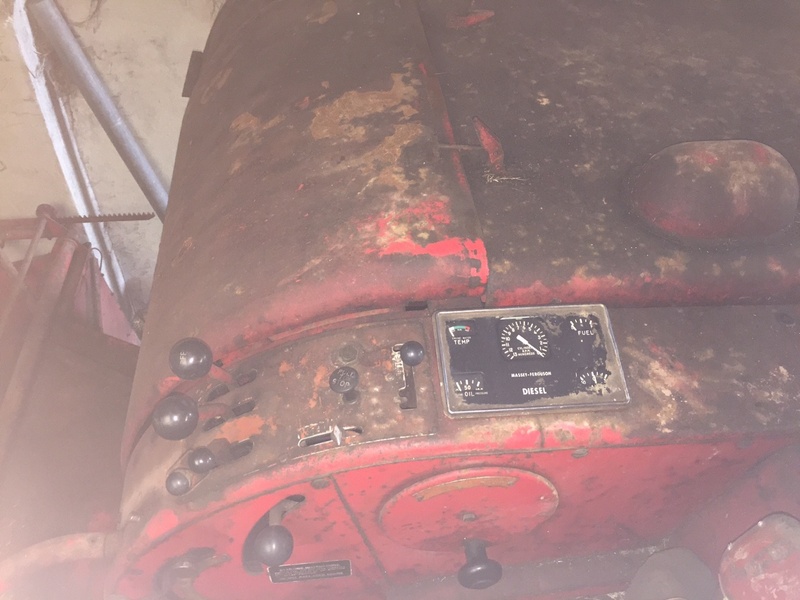 This model carries the same Perkins A4 300 engine which is well suited to the combine and its reliability is second to none, we have never suffered engine issue's fortunately. Unlike the 400 this model carries 6 straw walkers and also a two speed threshing cylinder as standard. The front tyres are in the best condition I've seen for a 1967 combine, normally they would need replacing as the walls degrade and crack as has happened to all our other combines, I think this machine was kept well out of sunlight and could possibly of been jacked up off it's wheels!! Along with the combine came a full set of manuals operator book and parts manuals and various spares bearings etc.. also Darren handed over an original set of Massey triple triangle decals! Which were purchased many years ago by the original owner but not used,which is very nice to have and probably the only original factory ones in existence, who knows. 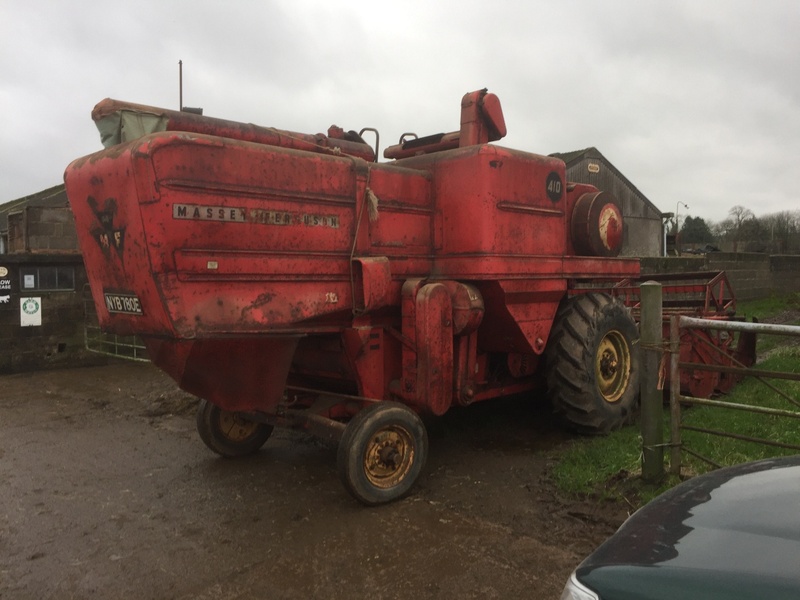 On Saturday 19/12/15 we set off the few short miles to pick up the combine, it was an appalling day and I remember thinking it's probably the first time this old girl has got wet for many years. 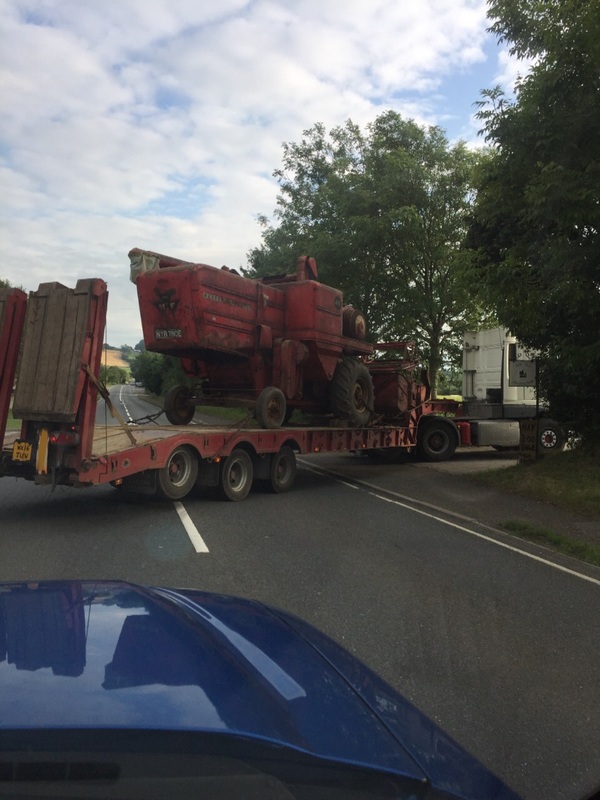 Again I asked my good friend Smaz if he would pick up combine with his low loader, although it's only a short journey, it would be foolhardy to run the combine this far without a thorough check over and its something I wouldn't be prepared to risk for safety reasons. 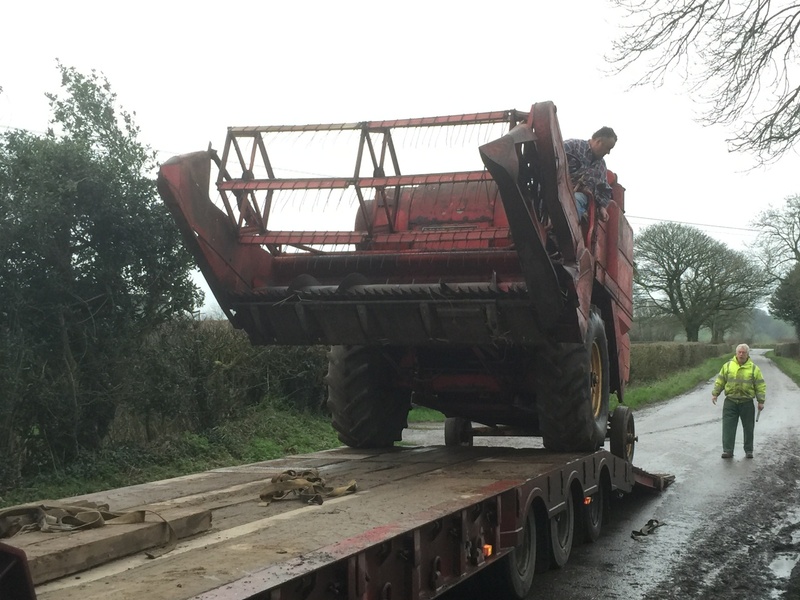 We just couldn't of picked a worse dismal wet December day, but with great help and assistance from Darren and his Father in the loading process at their cider farm, the move went very smoothly. As I followed behind this Kilmarnock survivor on her first trip out for many years I felt very privileged to take on another piece of our vintage harvesting history of bygone years and looked forward to seeing this combine once again moving across a Somerset cornfield and bringing in the Harvest. Since obtaining the combine I have rectified the column gear change linkage which needed adjusting and lubricating, I have also ran the combine up checking the many bearings belts and pulleys, all seems to be ok several belts will have to be replaced and won't last a harvest, the combine has been well greased and lubricated, my concerns are that the oil wiped onto the panels and bodywork has resulted in flaking off of the paintwork and when I attempt to clean off the machine in the spring I think I will be looking at a full paintwork restoration which is a considerable amount of work, but at this stage I'm more than prepared to tackle another one especially this one! Time will tell I guess. The guards are all present however, the table ones which cover the knife drive and reel pulleys are very badly dented and will require major reconstruction, which is very common unfortunately on these combines, as they are usually hit against gateposts and building doorways and they are not constructed sufficiently to withstand any minor collisions!! The following pictures were taken on the day of Collection, not the best I'm afraid but over the next few months I will endeavour to list more on this combine as I prepare to return it back into full working order hopefully in time for harvest 2016!! 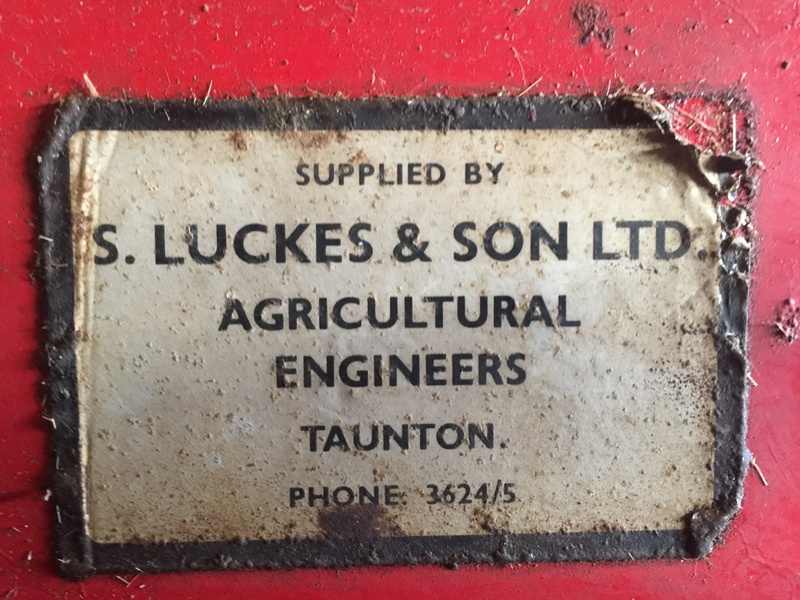 Once again special thanks to Darren Wilcox who appreciates what we do here ,and has given me the opportunity to save another piece of our farming heritage. And Friend Hillary who helped with the positioning of the combine in its new home. More to come in the spring! 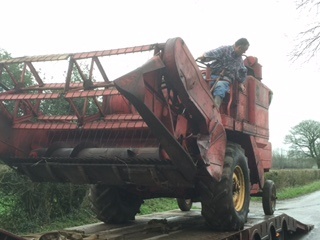 On a very wet December day this forlorn looking machine arrives at her new home! Badly damaged table guards can be seen in this unloading shot! I haven't got the same faith in the brakes as my good friend Hillary has! Walking up behind me? Supplying Dealers stamp on combine hood! The layers of dust and oil on combine several millimetres thick!! 1967 410 fitted with a swath guide on the rear. June 2017 and my 410 is brought home from its current storage to give it some well deserved TLC first job steam clean off 50 yrs of harvest grime! and start on the road of assesing what needs replacing adjusting or unceasing!. Removal of all the panels and guards for cleaning and inspection of he belts and various chains. A month later with the replacement of 6 belts and two bearings, and plenty of TLC in the cleaning process all that's left is an oil and filer change and a long run up to check everything . It never ceases to amaze me despite the length of time these machines can be found which hasn't worked! 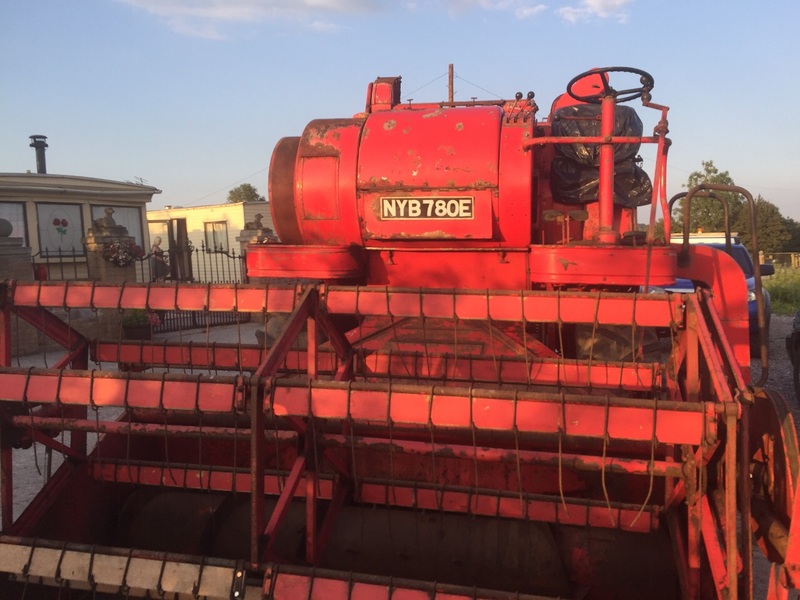 The various components are always in pretty good shape,. All we can do now is sit and wait for the crop! And nurse this old lady back into the job she was built for. More photos to follow of our 410 harvest.